Dr. David Eggleston is an Alumni Distinguished Undergraduate Professor at NC State University, and also serves as Director of NC State’s marine laboratory, the Center for Marine Sciences and Technology (CMAST), located in Morehead City. 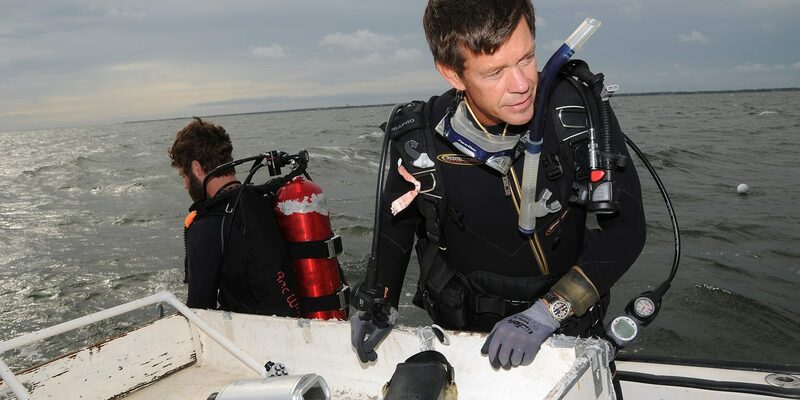 He leads the Marine Ecology and Conservation program at NC State University, where his research spans fisheries ecology, habitat restoration, conservation biology, deep sea biology, detecting ecological impacts, behavioral ecology, population dynamics and modeling, and marine science education. Eggleston has been conducting basic and applied marine research since 1985, and serves on the advisory boards of state, national and international coastal and marine science organizations. Eggleston has been recognized for excellence in research by the National Science Foundation via an Early Career Award, excellence in outreach via an Outstanding Extension Service Award by NC State University, and is a member of the NC Academy of Outstanding Teachers. He loves scuba-diving, boating, fishing, and playing drums in his son’s band, The Brothers Egg. Emphasize testing and refining general ecological theory and concepts in marine systems with the goal that answers will: (1) make important contributions to our understanding of ecological patterns and processes in marine ecosystems, and (2) be applied to sustainable management of natural resources and coastal communities. Use a combination of field observations, field and laboratory experiments, computer simulation modeling, and geochemical tracer and molecular tools to test assumptions and develop a mechanistic understanding of animal behavior, population connectivity and ecosystem dynamics. Study systems range from tropical to temperate, and shallow estuarine to deep-sea. Study species range from marine and freshwater fish to macro-invertebrates, especially crabs, lobster and bivalves. Research spans the disciplines of biology, ecology, physics, economics, mathematics, statistics, and chemistry. Graduates become future leaders in academia, research and management.